It’s amazing how a fresh new cover can bring a book back to life. 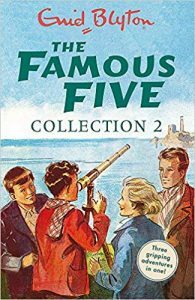 Think about all those Enid Blyton series like The Famous Five. How does a 50 year old series look so cool and relevant? The new funky cartoon covers make it look like it was just written yesterday. While some can be seen as mere cash grabs (I’m looking at you Harry Potter with your House-Coloured pages collection haha), rejacketed covers extend the shelf life of a story, series or the author’s brand, fighting their way to that ‘legendary timeless’ status that all writers dream about. So imagine my surprise when Puffin wanted to re-rejacket my covers. I was pumped to see my older books reaching out to a new generation. If a publisher is willing to pour money into designing new covers, you know that you’re on a roll. Plus quite recently, a bookseller told me that my first covers LOOK OLD, so it was good timing. I think new covers can do wonders. 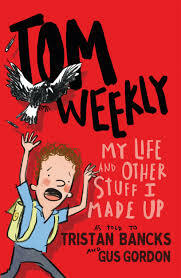 One prime example is the My Life books by Tristan Bancks with illustrations by Gus Gordon. 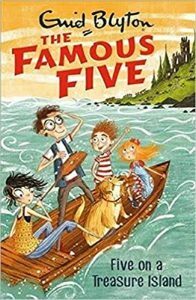 I reviewed the first book, for Buzz Words (online mag for those who want kidslit industry news) and it was a hoot. 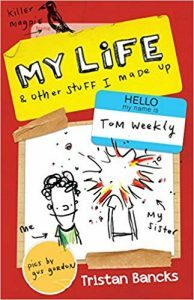 But the series really took off when PRH gave it a modern reboot, with the name of the main character, Tom Weekly on the cover. Then things got really funky with these current covers, where it almost looks like a completely new series…yes TOM WEEKLY is the star now. Yet the stories are still the same. Funny how the killer magpie has survived the cut each time hehe. This is such an awesome case study of book re-design that it was the focus of a recent designer’s conference. But this is proof that a fresh new cover is a win-win for all involved. Yes, kids do judge a book its cover, in fact, we all kind of do, which is why cover design can be make or break for a book. The major reason behind the new covers is to keep me, Oliver P, fresh (ha!). People raved about the cover for Natural Born Loser, and the new book, Don’t Follow Vee has kept that same style and tone. So the older titles are going to look like that, as if it’s my own series hehe. Now it’ll be easier to spot an Oliver P book in the wild. While I still have dreams of that box set, I’m happy to finally get my own DUMP BIN! (It looks more glam that it sounds, really) so all the books can be displayed in there. The battle for space in a bookstore can be tough, especially for older titles. Now it’ll be easy to find Punchlines or The Other Christy on the shelves. I’m thankful that the lesser-known cHEwY creations like Thai-no-mite get another shot in the spotlight. 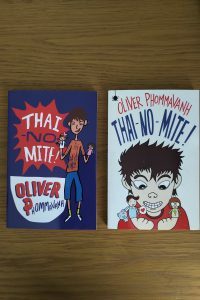 Another selling point will be that Thai-riffic! will be 5 BUCKS! This will be a way for new readers to give me a chance and also ease people into buying more of my books. I’ve seen it done before elsewhere so it was kinda cool to have one of my titles to get that discount. Limited time only of course hahaha. So we’ll see how we go when all the books with new covers come onto the shelves in April and May. I will miss some of the older covers, and will always have a soft spot for them. But I need to stay relevant in this children book game, and this will ensure that I’ll have a new bunch of cHEwY gum gums who will discover my books. It will also cater for frantic collectors who likes collecting covers too hehe.